Jungle Brothers - What U Waitin' 4 ? 2012 Reissue include 2 Bonus Tracks! De La Soul and A Tribe Called Quest may have been more commercially successful, but the afrocentric, jazz political rap movement and unfadeable Native Tounge Massive started with the Jungle Brothers. 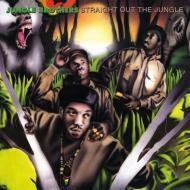 Their debut full length “Straight Out the Jungle” opened up many doors that are walked through by artists like Mos Def, Common and even Kanye West. Their taste for jazzy horn samples helped kick-start the entire jazz-rap movement, and their James Brown fixation was one of the first. Plus, the group’s groundbreaking collaboration with legendary house producer Todd Terry, “I’ll House You,” paved the way for numerous hip-house hybrids that shot up the dance and pop charts over the next few years and appeared to be a staple on every East Coast Rap Album from ‘88 until ‘92. The opening track “Straight Out the Jungle” samples the classic Bill Withers drum break as the JB’s tell you where they are coming from. “Black Is Black” (featuring a young Q-Tip) and “Sounds Of The Safari” introduces the pro-black edge, while the sexually subtle classics “Jimbrowski” and “I’m Gonna Do You” are funny, clever and timely. Hard, smart, fun, clever and brilliant, Mike G., Africa Baby Bam and Sammy G may not have realized it but they crafted a classic rap album that stands the test of time!